Winter is a great time for soup...bead soup that is! I know it's really almost technically spring, but the current snow outside the window begs to differ. 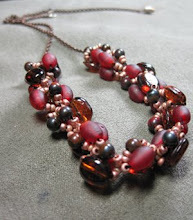 I signed up back in January for Lori Anderson's Bead Soup Blog Party and I was lucky enough to be paired with Krafty Max or Krafty Max Originals. She does some beautiful work in a variety of different beading styles so I'm excited to see what she'll design based on the soup ingredients I sent her. 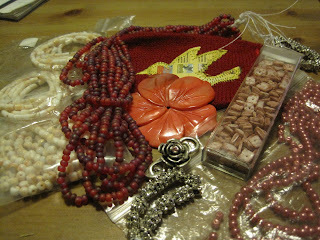 She sent me an amazing amount of beads and a really interesting focal type that I've never worked with before. I'll be revealing my creation at the end of the month, but expect a post sometime soon about what's inspired in regards to the piece that I am creating.